Why should I do business with you . . . and not your competitor? Whether you are a retailer, manufacturer, distributor, or service provider -- if you cannot answer this question, you are surely losing customers, clients, and market share. This eye-opening book reveals that identifying your competitive advantages (and trumpeting them to the marketplace) is the most surefire way to close deals, retain clients, and stay miles ahead of the competition. They don't have a competitive advantage but think they do. They have a competitive advantage but don't know what it is -- so they lower prices instead. They know what their competitive advantage is but neglect to tell clients about it. They mistake "strengths" for competitive advantages. They don't concentrate on competitive advantages when making strategic and operational decisions. The good news is that you can overcome these costly mistakes -- by identifying your competitive advantages and creating new ones. Consultant, public speaker, and competitive advantage expert Jaynie Smith will show you how scores of small and large companies substantially increased their sales by focusing on their competitive advantages. When advising a CEO frustrated by his salespeople's inability to close deals, Smith discovered that his company stayed on schedule 95 percent of the time -- an achievement no one else in his industry could claim. By touting this and other competitive advantages to customers, closing rates increased by 30 percent -- and so did company revenues. 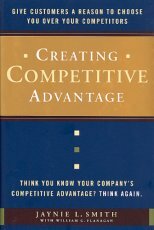 Jack Welch has said, "If you don't have a competitive advantage, don't compete" This straight-to-the-point book is filled with insightful stories and specific steps on how to pinpoint your competitive advantages, develop new ones, and get the message out about them.